At last! 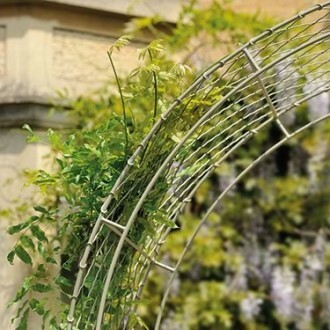 We’ve finally found a colour that works so beautifully with plants, whether on an arch in a garden setting or trellis panel against a terrace wall. Our new Light Bark paint can be seen in our new brochure and at the foot of each product page on our website. We’re confident that it’s the most sophisticated and appropriate colour that we’ve ever offered in our garden paint range. We endeavour to offer tasteful products and finishes, with attention to detail high on our list of priorities. This is why we never use gloss black paint or plastic fixing details on any of our products, unlike so many cheaper alternatives. Our new brochure has also been launched this month, showing our latest designs of door canopies, porches, arches, window boxes and fireguards. If you’d like a copy please get in touch or download our latest version from our website. If you have any questions or would like to place an order, please call us on 01225 851577.